My Black eyed beans salad is the perfect lunch break! It’s light and healthy, very easy to make and last but not least very filling! Just mix in a bowl 100 gr of boiled black eyed beans, one red pepper cut in small cubes, 5-6 cherry tomatoes, some fresh coriander and parsley (finelly chopped) and a bit on onion, cut in fine pieces. Make a dressing by adding 3 tbs of the best olive oil you can get, a splash of red wine vinegar and 1 tsp of dijon mustard, salt and pepper and mix it well with a fork. 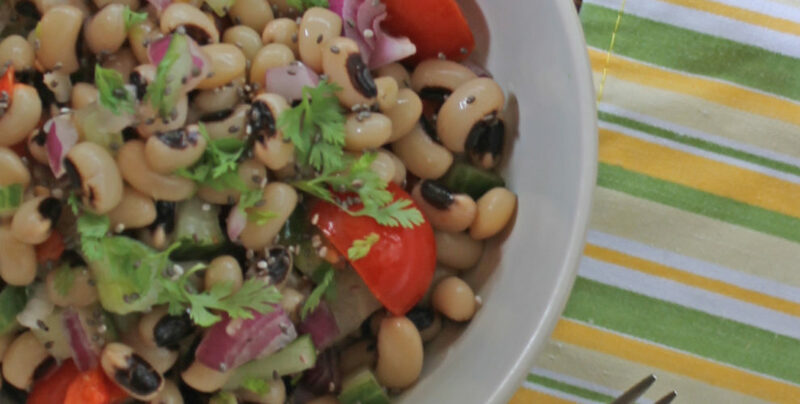 Drizzle the black eyed bean salad with the dressing and serve! TIP : If you are going to eat the salad later in the day, make sure that you ‘ll add the onions and the dressing just before eating it! enjoy!